Are Natural Retailers Better Than Manufacturers In The Consumer Health & Wellness Space? A new report out this week by Imperial Capital focuses on consumer health and wellness stocks ahead of Q2 earnings season. Analyst Mitchell Pinheiro lets investors know what they should expect from the sector and which stocks are Imperial’s top picks. Imperial continues to favor natural retailers over manufacturers. “Our positive view on the natural retailers is based on our outlook for stabilizing comp store growth, stable margins against a favorable consumer backdrop with an improving employment picture and rising consumer confidence levels,” Pinheiro explained. Consensus EPS estimates for consumer health and wellness stocks have continued to decline in recent weeks. Since the end of March, consensus June quarter revenue expectations for the stocks within Imperial’s coverage universe have fallen by an average of 1 percent, while consensus EPS expectations have dropped by 3 percent. Despite the softening forecasts, Pinheiro points out that the valuations of many of the stock remain above three-year averages. While manufacturers currently trade at an EV/EBITDA multiple of 18.4 times, natural retailers currently trade at an EV/EBITDA multiple of only 9.6 times, a 48 percent discount to manufacturers. This discount was only around 10 percent as recently as three months ago. 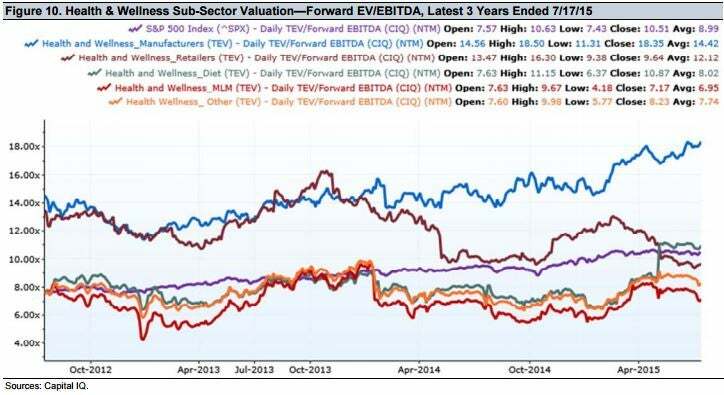 The sub-10 EV/EBITDA multiple for natural retailers is also 30 percent below its three-year average. Imperial names Landec Corporation (NASDAQ: LNDC), Inventure Foods Inc (NASDAQ: SNAK), Natural Grocers by Vitamin Cottage Inc (NYSE: NGVC), SunOpta, Inc. (USA) (NASDAQ: STKL) and Whole Foods Market, Inc. (NASDAQ: WFM) as its top stock picks in the space ahead of earnings.